Thanks to a three-year grant from the M.J. Murdock Charitable Trust, Professor Amy Spivey and Jordan Fonseca '18 spent the summer collaborating with scientists from three other Pacific Northwest universities to advance the science on renewable energy. AS: We're trying to optimize the performance of a device called the luminescent solar concentrator (LSC) that's used to increase the efficiency of photovoltaic solar power generation. The LSCs collect sunlight over a large area and focus the light, converting shorter wavelengths into longer ones. The resulting longer-wavelength light can be converted to electrical energy in photovoltaic solar cells more efficiently than the shorter wavelengths. This sort of energy-related research is important because we need sustainable sources of electricity. JF: The thing that's unique about this project is that it's such a large-scale, long-term collaboration at the undergraduate level. We're working with physicists and chemists at George Fox University, Pacific Lutheran University, and Western Washington University. None of us had ever met before, and this summer we sat down to talk about what each group would be doing and how it would all fit together. AS: The Murdock Trust established two of these undergraduate collaborations as pilot programs similar to what the National Science Foundation funds at major research universities. What's interesting is that as an undergraduate professor, my job is not only to produce new knowledge, but to train future scientists. We might do this research at a different pace than they can at a research university, but we are committed to training our students who may go on to make even bigger discoveries. JF: It's great to have the small class experience during the semester, with professors you get to know well, and then have the opportunity to connect with their research in the summer. It's the best of both worlds. AS: And it's not just research. 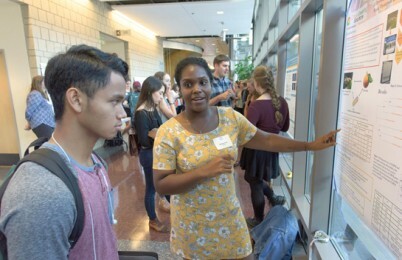 Students write grant proposals to compete for summer funding, and then present their research in a poster session in the fall, so they practice communicating their ideas in different ways. JF: It was really inspiring and motivating to work on research with potential real-life value. This work could change the way we collect energy, and that's exciting. 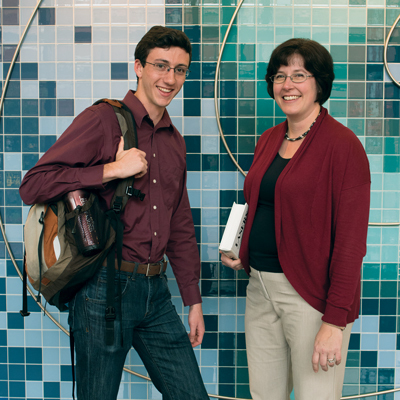 Puget Sound offers many opportunities for students to engage in research and travel. This past summer nearly 90 students conducted research on topics ranging from "Narratives of Victorian Technology" to "Quantification of Marijuana Use Via Wastewater." Summer research grants are awarded on a competitive basis, and students must submit a grant proposal, as well as present their research to the community in the fall. Thanks to generous gifts from donors, many students receive research stipends for their work, and are eligible to live on campus for the summer. Danielle Dixon '18, a biology major, presents her findings at the Summer Research Symposium.